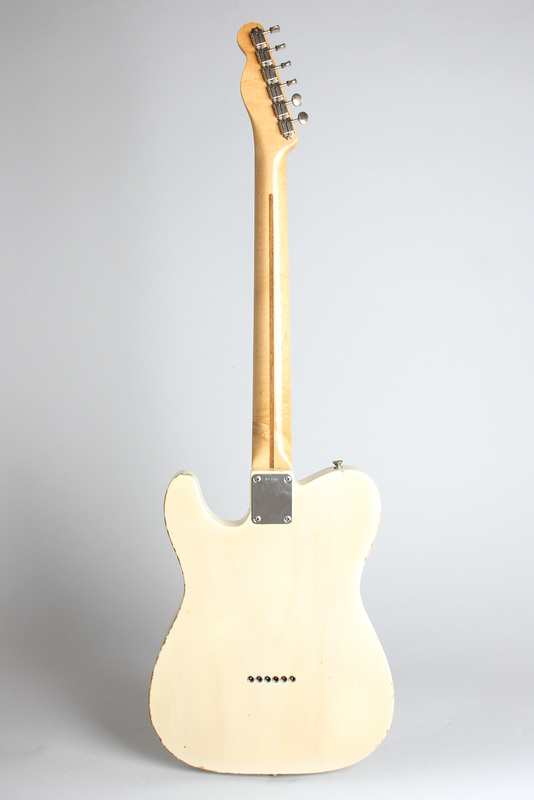 Fender Telecaster Model Solid Body Electric Guitar (1955), made in Fullerton, California, serial # 09456, Blonde lacquer finish, ash body, maple neck, original tweed hard shell case. 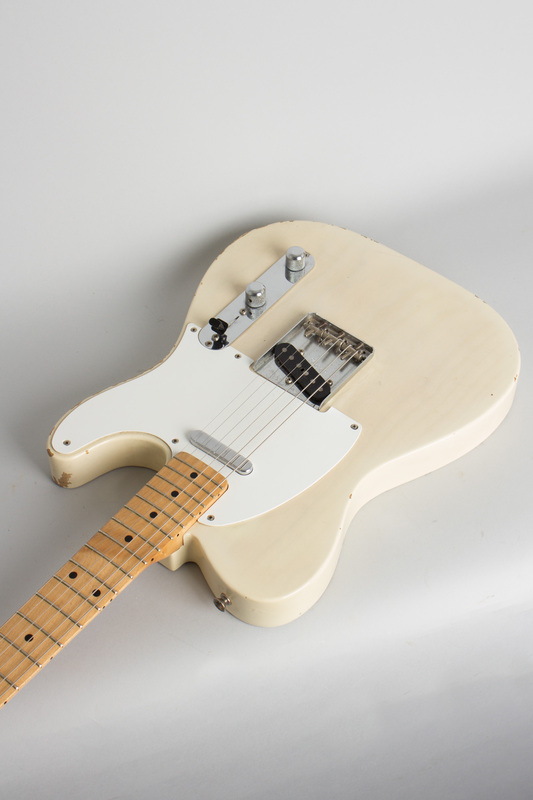 This spectacularly well-preserved early "whiteguard" Telecaster is a superb example of Fender greatness, absolutely unaltered and simply a fantastic instrument. 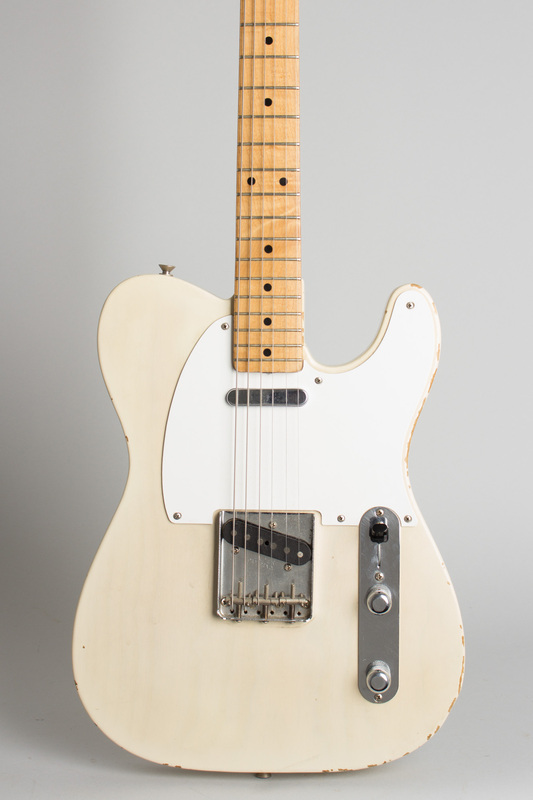 This late 1955 guitar shows many of the changes of the "white guard" period in '50s Tele history, with features specific to this exact time period. 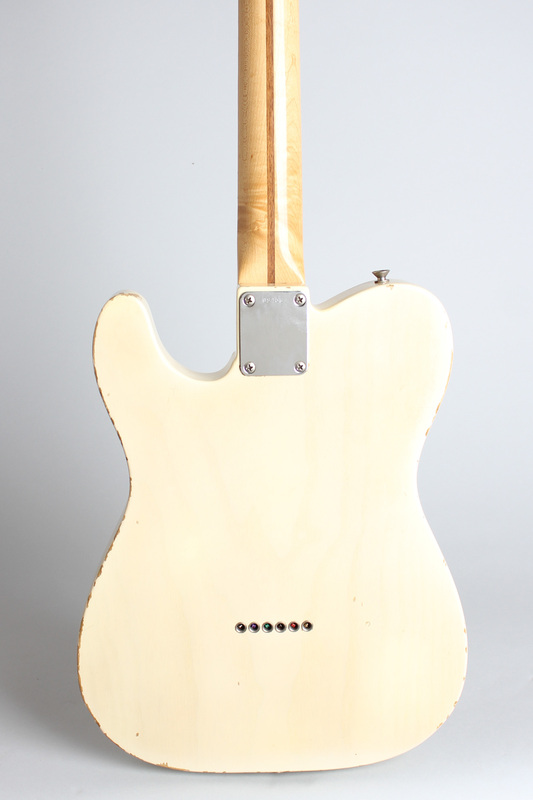 The most noticeable is then-brand-new single-ply white plastic pickguard, just then starting to replace the earlier black phenolic piece on Teles and Precision Basses, making the look and production materials consistent with the then-new Stratocaster. On the headstock the old script Fender "Telecaster" logo decal still sits below the original style round string tree, both unchanged from 1951. 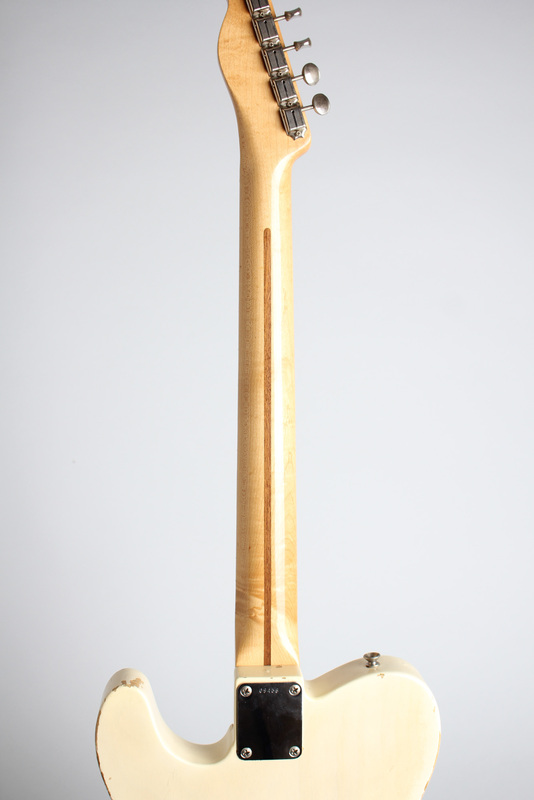 The very strikingly-grained ash body has a much lighter and "whiter" blonde finish compared to the darker earlier '50s style butterscotch hue. This "white-blonde" look would be the norm in the late '50s, continuing up into the CBS era. The one-piece maple neck is dated 10-55 and still has a chunky, round profile with just a hint of slope to the shoulders, more reminiscent of the earlier '50s style but beginning to hint at the "V" that was to come in 1956-7. The flat-pole pickup back at the bridge is still in "Blackguard" sound territory, as the staggered-pole variant about to be introduced would change the tonal character of the guitar somewhat. This guitar's period wiring is untouched and unaltered since it was assembled by Mary on 10-21-55 when she left her name on masking tape in the cavity; the original control settings are still intact. These are, on the 3-way switch: #1 neck pickup on bass-heavy rolloff setting, #2 neck pickup with straight tone control, and #3 bridge pickup with tone control. 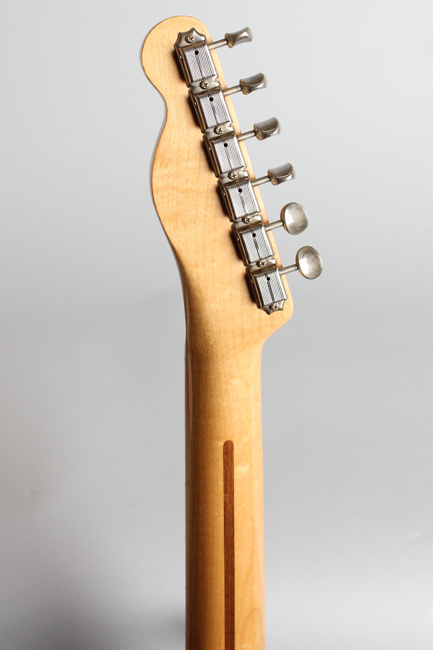 The pickups can be blended only by carefully positioning the switch in the "2 1/2" spot. 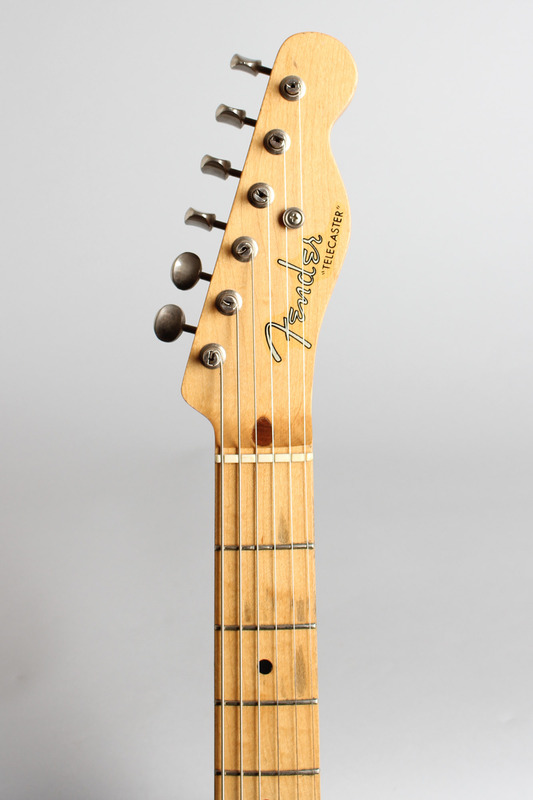 The serial number is stamped on the neck plate and leads off with a "0", a new feature having just moved there from the bridge unit when Fender harmonized all their electric guitars into one number series earlier in 1955. The knobs are a smoother-sided knurl with a dome top and the switch tip is the new "top hat" style just introduced. 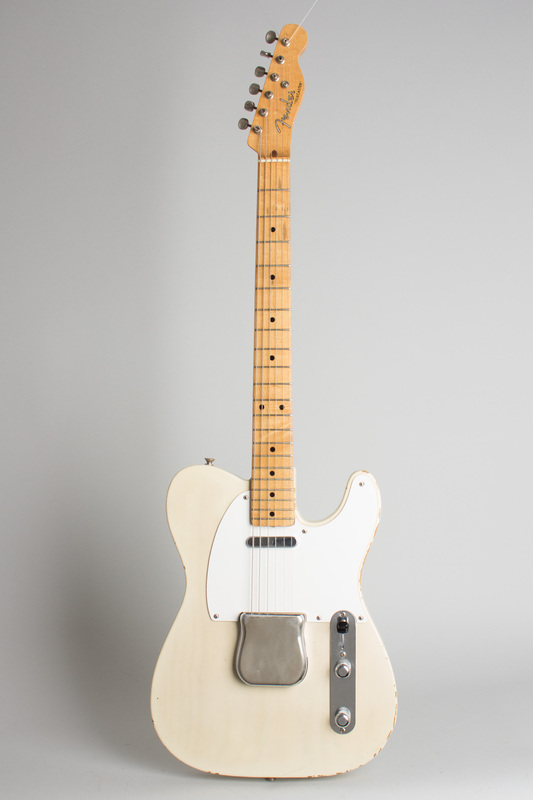 This 1955 Telecaster is quite the looker but is also a fantastic-sounding guitar and a joy to play -- and even to take out of its amazingly well-preserved tweed case and just smell! 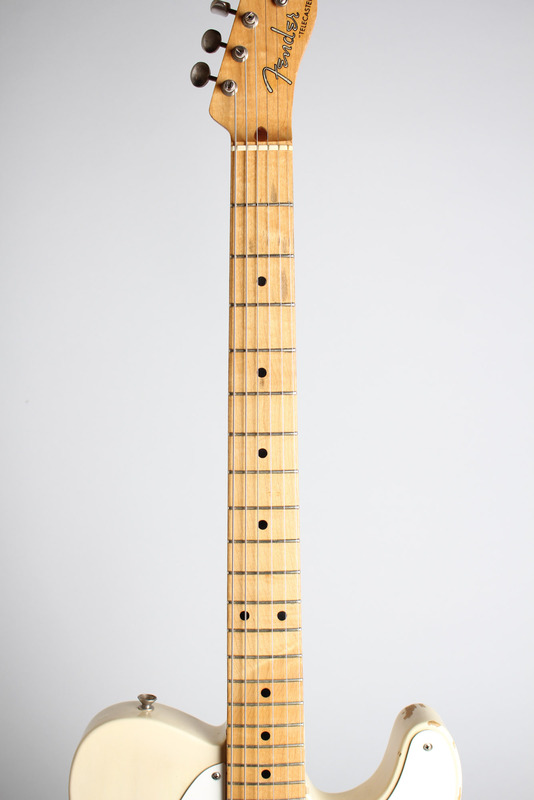 By 1955 the Telecaster had become a success, renowned as a popular tool used by working musicians, including a host of early rock'n'roll and country players. Many have been played for decades and worn virtually into the ground; few have survived as nicely as this one! Overall length is 38 3/4 in. (98.4 cm. ), 12 5/8 in. (32.1 cm.) wide at lower bout, and 1 3/4 in. (4.4 cm.) in depth, measured at side of rim. Scale length is 25 1/2 in. (648 mm.). Width of nut is 1 5/8 in. (41 mm.). Absolutely 100% original and unaltered, this is one of the most spectacularly well-cared for 1950s Fender guitars we have seen in a while! There are small wear spots and flakes to the body finish, some from wear and some from what looks like old moisture exposure. The fingerboard has wear just in the "Cowboy Chord' first position, with the original frets showing just a little wear and previous work in the same area. Most of the chrome is still shiny; there is a bit of scuffing to the neck pickup and the snap-on bridge cover, which must have been on all the time as the bridge area looks virtually new! The original case is also in very fine fettle, and includes the period strap, cord (with one end missing), and a well-used but still intact early-style Fender-branded polish cloth. They don't come a lot better than this one -- and if they do, most folks are afraid to play 'em! Excellent + Condition.